A great outcry has arisen by the general public in the matter of the vulgarity that is being put over the footlights in most of the non-stop Shows running at the present moment, and I would particularly draw the attention of my patrons to the fact that ever since this House started in February last, initiating the idea which has been so truly badly copied, Mrs. Henderson has made it a rule that any artiste thinking he can put anything over our footlights which comes under the above category, should not find a job in this theatre. We are by no means prudes here - far from it - and we realise that broadness in speech and subtlety add greatly to an entertainment, but we also realise only too well the feelings of a man coming here with his wife of fiancee or daughter and having sheer muck in dialogue thrown at him in such a way that it is impossible to protect himself except by not visiting the house again. This, of course, we realise has happened in most of the opposition houses, and I do hope my patrons appreciate the fact that never under any circumstances will this Management permit anything of that description to take place. 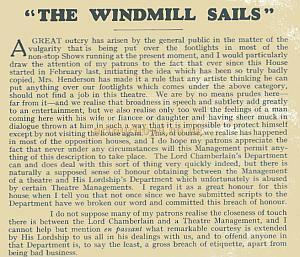 The Lord Chamberlain's Department can and does deal with this sort of thing very quickly indeed, but there is naturally a supposed sense of humour obtaining between the Management of a theatre and His Lordship's Department which unfortunately is abused by certain Theatre Managements. I regard it as a great honour for this house when I tell you that not once since we have submitted scripts to the Department have we broken our word and committed this breach of honour. I do not suppose many of my patrons realise the closeness of touch there is between the Lord Chamberlain and a Theatre Management, and I cannot help but mention en passant what remarkable courtesy is extended by His Lordship to us all in his dealings with us, and to offend anyone in that Department is, to say the least, a gross breach of etiquette, apart from being bad business. Vivian Van Damm - From a Windmill Theatre Programme of 1932 - Courtesy Maurice Poole.